It seems ages since I was in Milan Malpensa the other week waiting for my flight home. The weeks seem to disappear so quickly and events and memories become a blur. The week has been one of reflection of this year’s events and a meeting over the weekend rolled the years back some 20 years for me. It’s been a quieter week for me this week and a chance to catch up on a few other things. I’ve been going through my event files and looking out some of my favourite pictures from this year. A small selection will go in to a picture review of 2007 in the February edition of Cycle Sport. Paging through the picture files on the computer makes you think about our perception of time. From a wet Southampton in January at the National Cross Championships to Mallorca and the training camps with T-Mobile. A feature shoot for Race Bike of the Year and the World Track Championships in March. It’s then on to the ‘Classics’ which rolls on to the Dauphine and then the Tour. The Tour of Ireland then followed by out Tour of Britain. Before you know it, it’s the World Road Championships in Stuttgart and the season is all but over. Then there are all the other jobs you do in between both home and abroad. Premier Calendar, Rides stories and rider features like the one Stephen Farrand and I did with David Millar in Girona. It seems so much in the time and I suppose is why we, certainly myself, perceive a compression of time and can not believe another year has passed. Anyway, I’m almost there with a selection of 25-30 pictures which hopefully you will see in Cycle Sport soon. I have to say the report of T-Mobile pulling out of sponsorship was shock news, though not a shock if you see what I mean. I suppose it had to come with all the continued drug-tainted image that cycling has attracted over the years, particularly with the events of the last couple of years finally tipping the scales. Lessons don’t seem to be learned and there always seems to be some rumour or story bubbling under the surface for the media to get their teeth in to. Don’t get me wrong, these name and shame stories have to be told so that we can go some way to eventually getting an even playing field and a stability back in to the sport. Everything seems so protracted though and I guess it’s human nature that there will always be someone prepared to take the risks in their pursuit of glory. No doubt the T-Mobile sponsorship had nearly run its course but to pull out sooner rather than later is a pity. I hope the team will be able to move on and our GB interest of Cavendish, Hammond and Wiggins can have a successful 2008. On a lighter note I took delivery of my new Toyota Yaris on Wednesday afternoon. Very nice. I have been putting in a few miles this week on the bike as ever. Monday was meant to be a bit of a leg spinner to ease out last Sunday’s 70 plus miles. I did my Monsal and Cressbrook run which is 41 miles. Along the way I caught a chap on the climb out of the Cressbrook valley and it became a bit of a battle. I’d said “morning” to him as I passed and then he tacked on to my wheel. I put the pressure on at the hairpin bend and I could hear him drop the gears as he stuck to my wheel. I sat spinning 39x21at 14mph up what must be 1:8 in places past the cottages that line the top section of the climb. I was just about at the limit when I finally broke clear and rode over the crest of the hill by the chapel. I slowed and let him catch up. “That hurt,” he said and I replied, “It hurt me too.” We got chatting and it turned out he was on his way to work in Tideswell, the next village but one along the road. He worked at ‘Wild Country’ who manufacture climbing harnesses and other equipment. It’s quite apt really with all the Limestone and Gritstone climbing routes around the Peak District. On Wednesday morning I did my Matlock run of 53 miles and Thursday I just did a steady 23 miles as I was perhaps feeling the effects of the last couple of days. I got out Saturday morning and did my Monsal run again. It was a beautiful morning, the light was fantastic. It was also good to see some good local club numbers gathering at their meet points as I made my way out in to the Peak. Rutland CC must have had 15-20 riders gathered at the bottom of Bents Road for their 9:30 meet. Then when I dropped down to Beauchief crossroads there was easily another 15-20 riders from Norton Wheelers ready to set out. I’d not seen them before and their club jerseys reminded me of the Euskatel kit. It’s been a while since I’ve seen those kind of numbers in this area. I saw some of the Rutland guys again as I came out of Tideswell to go over towards Bradwell. When I got back from my ride on Saturday I got myself sorted to go straight up to York in the car to meet up for a reunion with a few of the guys I went to Polytechnic with 20 years ago. Back in 1984-87 I did a degree in geology at Kingston Polytechnic in Surrey. All but one of the eight guys I met up with yesterday I’d not seen for 20 years. The one other I’d seen back in 1989. I got to York around two o’clock and parked in one of the car parks on the ring road off the A19. I walked in towards the centre for our arranged meet at the Maltings Pub close to the river. Walking through the historic streets of York there was quite a Christmas feel as hordes of shoppers ambled through some of the narrow back streets. I navigated my way to the Maltings and stepped inside. 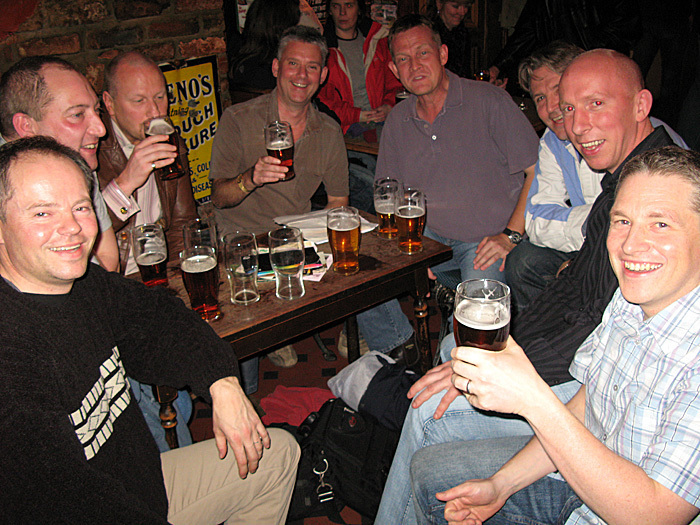 The small traditional ale house was filled to the rafters and it took a second or two to pick out the lads. It’s was quite a strange feeling, surreal in a way to see faces you have not seen for so many years. I have to say it took a couple of takes to take in all the faces sat around the table by the fireplace. So there they were Mike Hook, Austin Gray, Mike Morley, Adrian Piper and Neil ‘Hovis’ Townley. We were later joined by Jason Marchant followed by Anthony ‘Pinky’ Payne and Pete Kehr. The banter was soon flowing and as one said, “It’s like going straight back to sitting in the Union bar.” Unbelievable. The old memory cells came back to life as we recalled the good and bad times, the bizarre and the crazy stories behind the stories of those days gone by. It was interesting to find out what everyone was doing now, were they married, did they have children, where were they living now and who else they had kept in touch with. So as we wandered from one traditional ale house to the next, so we learned something we didn’t know perhaps at the time, or re-lived a moment in time from our days back in Kingston. As you might have picked up, traditional real ales formed a requirement for the evening. It can be said that I’m not really a drinker. I have been know to have the occasional beer or glass of wine but as a rule I don’t partake. Hence, when the ‘alternative’ degree notification paperwork turned up during the evening, my entry was as follows, Jones, A. Degree in ‘The fine art of drinking three strong shandies.’ The aforementioned paperwork had been posted on the School of Geology notice board just before the official notification of our awards. It had been done on official headed School of Geology note paper and had received a mixed reaction as people’s misdemeanours or otherwise had been skilfully crafted in to amusing degree titles. All hand typed. No laptop and printer in those days. The evening was rounded off with a fantastic curry at the Kings Ransom Indian Restaurant close to the river. A truly memorable night. On a cycling connection it turned out that Pete Kehr, now living in Kenya and working in the coffee bean industry, had done a lot of the set up for Paul Sherwen’s gold mine in Uganda a few years back. Mike Hook’s IT company ‘2i’ had done the computer and software installation in Leon House, Croydon when Cycling Weekly and Cycle Sport moved there from Kings Reach Tower in central London. The company have recently been working in the new IPC Blue Fin Buildings at Southwark. Small world! Sunday. Weather awful here. Rained all day. Will see what next week brings.